The Ecoteck Elena pellet stove is available in three versions; the standard full majolica bodied model, the majolica bodied ductable model (Airplus), and the Elena Steel. The Elena Airplus was the winner of the HPBA, (Hearth Patio and Barbecue Association), Vesta award for the 'Best new pellet stove and insert' in 2009. Elena: Majolica side panels and top in black, bordeaux, parchment and oriental earth. Elena Steel: Majolica corners and top section in black, bordeaux and parchment. Elena Airplus: Ducted. Majolica side panels and top in black, bordeaux, parchment and oriental earth. Capable of heating up to 2,000 square feet and producing 48,000 btu., The Ecoteck Elena features a seven day programmable timer, a humidifier tray in the top, remote control and GPRS text message control, stainless steel heat exchanger and a centrifugal fan. Standard fittings on Ecoteck stoves are the FIREX 600 combustion chamber and Majolica panels, (See comments below). Weight Elena, 353 lbs., Elena Airplus (ducted) 375 lbs. Window Size 13.4 in. by 10 in. Rear Vent Height 12.8 in. Elena and Elena Airplus: Majolica side panels and top in black, bordeaux, parchment and oriental earth. Construction Type The Elena and the Elena Airplus have cast majolica bodies with steel internal structure. The Elena Steel is made from fabricated steel with a majolica top insert. 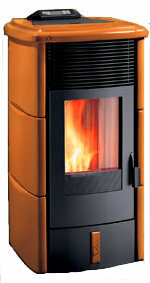 If you would like to leave a review of the Ecoteck Elena pellet stove, please use the form on the contact page.